SACRAMENTO, Calif. – Sacramento police shot Stephon Clark seven times from behind, according to autopsy results released Friday by a pathologist hired by Clark’s family, a finding that calls into question the department’s assertion the 22-year-old black man was facing officers and moving toward them when he was killed. Dr. Bennet Omalu, whose study of a degenerative brain condition in football players prompted the NFL to adopt new safety rules designed to prevent concussions, also determined Clark took three to 10 minutes to die. Police waited about five minutes before rendering medical aid. “The proposition that has been presented that he was assailing the officers, meaning he was facing the officers, is inconsistent with the prevailing forensic evidence,” Omalu said at a news conference with family attorney Benjamin Crump. 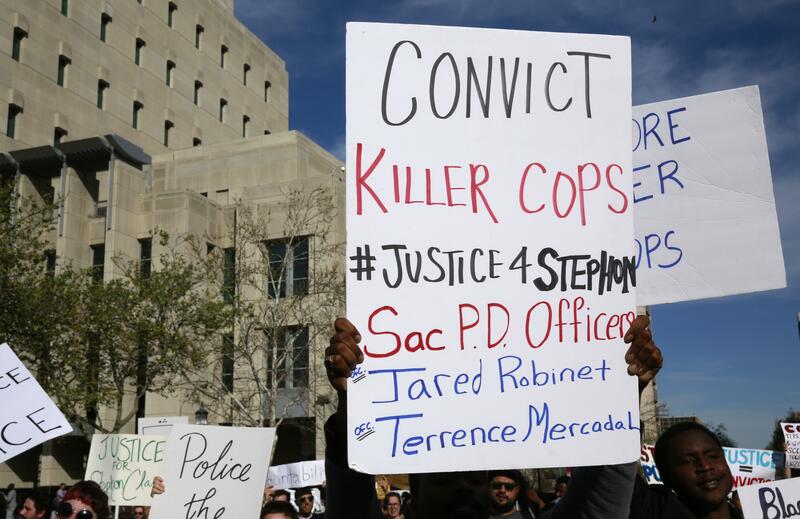 Sacramento police responded with a brief statement that said the department had not yet received an official autopsy report from the Sacramento County coroner’s office. It said the coroner’s death investigation is independent from the investigation being conducted by police and the state Department of Justice. The shooting has produced almost daily angry but peaceful protests in the downtown area of California’s capital city. The autopsy heightened calls for justice and skepticism toward police among community activists. The helicopter video shows the two officers at the corner of Clark’s grandmother’s house and Clark on the backyard patio. He moves toward the officers’ position as they peer around the corner and open fire. Omalu said any of the six bullets that hit Clark in the back and one in the neck could have been the fatal shot. An eighth bullet went into Clark’s thigh. But protesters never came to the arena Thursday night, heeding calls from Clark’s brother, Stevante Clark, and Black Lives Matter organizers to avoid the arena. Published: March 30, 2018, 12:29 p.m. Updated: March 30, 2018, 5:51 p.m.